"On March 11, 2006, about thirty members of the San Fernando Band of Mission Indians gathered near the site of a new development in Palmdale, one of the two cities in the Antelope Valley. Representing the Tataviam and Fernandeno tribes in the Antelope, Santa Clarita, and Victor valleys, they had come to rebury six of their Vanyume ancestors who had been unearthed two years earlier as land was being bulldozed to make way for the 5,000-home Anaverde community just off the Avenue S exit ramp. The six individuals—men, women, and a baby—were about 800 to 1,000 years old. They were found in separate graves, with a crumbling stone hearth nearby—perhaps a remnant of a burial ritual. One of the ancients, most likely a shaman, was buried with 1,500 shell beads. As late-winter snowflakes fell to the earth, some members of the gaily bedecked group placed offerings of tobacco, sage, and knives in the graves, gifts for the eternal journey, and there was traditional singing and drumming and the shaking of rattles. A backhoe covered the graves, and within a few weeks, a steamroller had finished the job. There was a new paved road over the old burial site, and the latest wave of suitors began to arrive in the Antelope Valley." "Most cops have chosen their line of work because they are the kind of person who wants to make a difference. Some perhaps have chosen naïvely, with little understanding of the way it is on the streets, pursuing a dream of wanting to be a police officer or fire fighter when they grew up. Others come right from the streets, a life of petty or sometimes hard crime in fact, heading for a world of trouble. Someone turns them around and they become a cop because they know how to talk to people who are falling through the cracks, especially kids. (Or, in the old days, they were pressed into service by frightened citizens, who sometimes hired outlaws as sheriffs. As the noted cowboy scribe Frank Waters wrote, "With a tin star he stood the chance of also wearing a halo of righteousness; without it, a noose.") Then there are those who instinctively know that someone has to enforce the rules of society, and they feel hypocritical if they don't walk the walk of the American credo: "We are a nation of laws, not men." And yet others join up for the camaraderie, the pension plan, the good salary, or a combination of all of these things, and then some simply fall into the gig because it suits their temperament— they are service-oriented, they feel comfortable in a world of rules—and once inside the club, they know they have come home. As far back as his friends can remember, Steve Sorensen wasn't telling people about wanting to be a policeman when he grew up, but it was clear that he liked to help people." "The first thing that any desert outpost needs is water. At first, Don acquired some large blue drums in a trade or because they were just lying somewhere, and he cleaned and sterilized them. Then he strapped them on top of an old Lincoln, headed to a friend's house, filled them up, and brought them home. With a makeshift system of pulleys, he would crank and lower the drums into compartments he had dug in the sand. There the water would remain cool and free from dirt, and he piped it into a sink in his trailer with a homemade hand pump. He also rigged an outdoor shower and used it regularly, contrary to the perception that solitary desert dwellers are caked with dirt and haven't bathed in months or years. As the days passed in his new desert abode, he walked the land in every direction, studying its rhythms and ways, coming to know where there were outcroppings of certain plants or trees, which meant there was water nearby, depending on what kind of plants or trees they were, and discovering ancient seeps in the buttes to the east. He also watched which way the water flowed and where it went after the summer monsoons, and soon he was able to dowse the terrain." Winner, 2013 Spur Award for best western nonfiction, contemporary. A Southwest Book of the Year. — Gustavo Arellano, author of Orange County and the syndicated column, ¡Ask a Mexican! 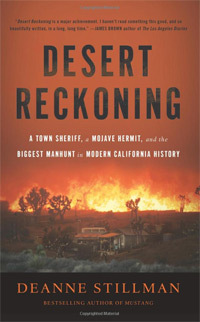 Deanne Stillman's new book is Desert Reckoning: A Town Sheriff, a Mojave Hermit, and the Biggest Manhunt in Modern California History. Just published by Nation Books, it was eight years in the making and will be available on July 3, 2012. It's based on Deanne's award-winning Rolling Stone piece, "The Great Mojave Manhunt." Continuing Deanne's long-time desert beat, Desert Reckoning has received advance praise has come from Publisher's Weekly: "Stillman skillfully excavates the vividly drawn landscape to reveal the desert's mystical spirit and history of human striving...Through the lens of a gripping true crime story, this beautifully written, humane book preserves the history of a remarkable and very American place and its people," and from Kirkus Reviews: "...Lyrical and intense...A dynamic synthesis of Western saga, true-crime thriller and California-based transformation narrative." The original Rolling Stone article was a finalist for a PEN Center USA best journalism award and appears in Best American Crime Writing 06. Click here to order signed copies at Powell's, Skylight Books, Book Passage or Tattered Cover. 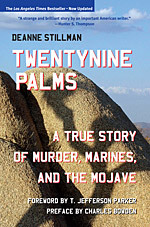 Deanne's previous books include the acclaimed Twentynine Palms: A True Story of Murder, Marines, and the Mojave and Mustang: The Saga of the Wild Horse in the American West. She currently writes the "Letter from the West" column for truthdig and she's a member of the core faculty at the UC Riverside Palm Desert MFA Creative Writing Program. Deanne’s dispatches: We’ll keep you posted on new book projects and other writing, along with upcoming author appearances. Sign up here.